Within the past few weeks I had a single experience that was an initial up and a subsequent down. It is not that I haven’t had this type of experience before; rather, this time I had a little bit more information and so the experience registered with me at a different level of consciousness. I received a call from a publisher who was having a very unhappy experience with the editing of a series of books. The final straw had arrived, and the publisher called me to ask about my availability. The deal was somewhat typical of many of the convoluted deals I experience in today’s global editing world. The publisher was not actually doing the hiring; its packager was responsible for the editing (and composition). The publisher intended to strongly suggest to the packager that it hire me for this book, if I was available. I advised the publisher that I would make myself available and would be interested in the project as it fit within my specialty of large projects. Consequently, the publisher made the suggestion to the packager and the packager contacted me. The packager made an offer, which was not acceptable. I advised the packager of the terms under which I would accept the project, which terms included payment, schedule, page counting, and fee. The initial stumbling block was the fee. The packager’s offer was too low. The packager said it would contact the publisher because the amount I was asking was more than was authorized. We never got past the fee. Because it was the publisher who originally contacted me, I kept the publisher in the loop by sending blind copies of my correspondence with the packager to the publisher. As it turned out, the publisher had authorized the increased fee. How do I know? Because the publisher called me, told me so, and asked if I would still be available if the miscommunication with the packager was straightened out. The publisher expressed surprise that the packager had made the decision on its own. But pricing is rarely set by those on the frontlines. The price decision is usually made by someone whose only contact with the project is a balance sheet. Although there may be flexibility in the price decision, it requires back-and-forth communication and justification, causing delay, which also affects other project aspects, such as schedule. Yet it also raises another possibility. If the intermediary can obtain services for less than the approved price, who, if anybody, reaps the benefit of the difference between the accepted price and the available price? More importantly, it raises the question of worth. What role does worth have in the decision-making process? For example, what is it worth to have a happy author? Or to know from experience with a particular editor that if you pay a little more you are unlikely to have to spend money fixing erroneous editing or consoling an irate author? Worth is a two-way street. Worth is not only involved in the question of how much should be offered to the editor, but how much should the editor require. I knew that the packager would have no problem finding an editor who would jump at the opportunity to do the project for the original price. I also know that at the original price and the level of editing required and the schedule to be met (remember that I had already done one book in the series), the editing could not be high quality — the combination of factors simply prohibits it; if it didn’t, I would have said yes immediately. Which makes me wonder what is the worth of editing to editors? If we value our services too cheaply are we not perpetuating the low-pay plague that has befallen editing as a result of globalization of editorial services and the rise of the transformative packaging industry? At what point does editing become a mere commodity, where an oversupply of editors forces the cost of editing downward because “editing is editing”? Unlike the maple syrup market, there is no market based on gradations; rather, “editing is editing” and all that matters is cost and speed as there is nothing to distinguish grades of quality. Isn’t this what the indie author market has been telling editors since the explosion of the ebook and self-publishing market? That editing is editing and only price matters? Isn’t this what is both put forward and reinforced on forums like LinkedIn where editors are told they charge too much and too many are not good editors or don’t understand editing and the sacrosanctness of the author’s words as written and misspelled/misused; that authors can do better by self-editing or peer editing; that “I lost [dislike] my job and so am thinking of becoming an editor.” And let us not forget those editors who move us along that path by proclaiming to the world that they will provide not only a “perfect” edit, but do so for as little as 25¢ a page. Increasingly, editing is viewed as having little financial value (worth). Increasingly, editors are shoring up that belief. It becomes particularly troublesome to me when I see that the ultimate client (in my tale, the publisher) is willing to extend itself but the intermediary is unwilling to take advantage of that willingness and is unwilling to provide the service that the ultimate client wants. The problem of worth is hydra-headed; the solution requires cooperation of a type that will never be in the passionately independent world of editing, which world also suffers the plague of easy entry. I have my own solution: I provide high-quality editing in a form that allows me to specialize. As a consequence, although clients pay me more, they save other expenses that they would have to otherwise incur, and so find in my services that balance of cost and worth. Where are you in this editing world? On a freelance list to which I subscribe, Carolyn Haley asked me, “Rich, do you get any personal or emotional satisfaction from your work?” The question was asked in followup to a posting I had made to a thread-opening question asking whether any editors had a “joy client or project,” that is, a client or project that brought especial pleasure to the editor. Some responders talked about clients, some projects, some teachers. …I always get personal satisfaction from every book I edit. If I didn’t, I would have long ago found a different career. Of course, there is also the personal satisfaction of running a profitable business, finding ways to beat the constant push to suppress prices, finding ways to become more efficient, etc. I also get satisfaction at seeing the number of subscribers to my An American Editor blog increase and to the number of times my articles are liked or tweeted. But the truth is that should my business or my blog cease tomorrow, I would not feel any less satisfied — personal or emotional satisfaction — because what truly gives me pleasure and satisfaction in life lies outside those confines. Bottom line is that I view what I do as a job, and the reward for doing a good job is making money. My personal and emotional satisfaction quests go toward my children and grandchildren — toward such things as making a cranky baby smile, playing catch with my 15-month-old granddaughter, helping her unload all the plastic containers from a cabinet and throwing them on the floor (although the subsequent rewashing and restoring isn’t so satisfying), seeing my son admitted to the bar of the U.S. Supreme Court, sitting with a book on location while watching my wife create a new painting, and the like. I do not view my editing as anything more than a job/business that I like and at which I am qualified and good. I look forward to going to my office and working, but I look elsewhere for personal and emotional satisfaction. I would find no satisfaction whatsoever in knowing that I did a magnificent editing job, turning a book from junk into literature, [only to find] that I have to struggle to get paid or to pay my bills. Editing is a means to an end, not an end in and of itself. I have wondered about this before. Years ago, when I was a member of the Editorial Freelancers Association, we had discussions on whether editors are artisans or business people. In those discussions, I was in the very tiny minority — many times a minority of one or two — who said we should be business people first, artisans second. Twenty years later, the discussion appears to not have abated. Think about painters, actors, writers, photographers, and other artists. How many do you know who are making a comfortable living solely from their art? Don’t most of those we know have either another job or a significant other who provides financial support? Think about why that is. Is it because their priority is personal and emotional satisfaction from producing their art rather than the business aspects of the art world? Consider, also, how many of them hire agents to handle the business aspects. Editors aren’t different. We make conscious choices to elevate one aspect of our work over another. There is nothing inherently wrong with this as long as we are willing to accept the consequences of those choices. For most editors, elevating the creative function over the business function means less income. Why? Because it becomes difficult to make appropriate business decisions. Do we give a manuscript a second pass, knowing that if we do we will find errors that we missed on the first pass, when that second pass will be at our expense, not the client’s expense? The artisan says “Yes, I make that second pass” because it is more important to reach perfection (the personal/emotional satisfaction) than to be adequately paid; the business person says “Not unless I am compensated for the additional work” because in the business world, decisions are made on a profit-loss basis. This is not to say that creative satisfaction does not play a role in the business-first approach or that business does not play a role in the creative-first approach. Rather, it is which is dominant and which approach forms the basis for decisions we make. I find it interesting that many of the editors who struggle financially are those who are unwilling to place personal and emotional satisfaction from editing second to sound to business practices. They tend to refuse work because it doesn’t appeal to them, ignoring the financial considerations. There is nothing wrong with such a decision as long as the editor understands the tradeoff. And, yes, I do know some editors who successfully place artisan values above business values and succeed. But for every Tom Hanks there are hundreds of unsuccessful actors. In editing, it is no different — for every successful editor who places artisanship first, there are hundreds who are unsuccessful. If we could all be exceptions, there would be no rule. Every morning I look forward to my editing day — even those days when I am editing a book on colonoscopies — because I know that every day brings me satisfaction. I know that I am an excellent editor, that clients are very rarely displeased, and that my services are in demand. I can look at my bank account and not worry. And I know that at the end of the day, I will be able to indulge in those activities that bring me personal and emotional satisfaction without worrying about how I will pay my bills. For me it is the business approach that has to dominate my editorial services. I need to be able to objectively evaluate clients and manuscripts based on financial return, not on whether a topic appeals to me. The very last thing I want to do is worry about meeting my obligations; the very first thing I want to do is face each day knowing at the workday’s end, I will be indulging in those things that bring me satisfaction. I would add one more “wondering.” I wonder how many editors who place creative above business have a family for which they are the sole financial provider? I suspect that it is easier to choose the creative over the business approach when there is a safety net of some sort or when the only person relying on your efforts is yourself. I admit I have never been in such a situation, which probably partially accounts for my business-first approach. In Part I of this 3-part article, I discussed the role reviews play in my decision-making process as to whether or not to buy a particular book. As noted, reviews are rather limited, largely because there are so few credible reviews and so many books published each year. In Part II, published yesterday, I discussed the role cover design plays and how good cover design acts as an assurance for the book buyer. Today’s discussion addresses the final legs of my decision-making process: Content and Pricing. A good writer grabs you with the first dozen or so words; a hack writer like me doesn’t have that knack. I am willing to plod through a nonfiction book but not through a novel. So I want to see that the story gets off to a good start. I also want to see how many errors there are in the first chapter. Perhaps it is because of my work, perhaps it is because I was always bothered by language misuse, or perhaps it is because I wish to be — at least in my own mind — a literary elitist snob, but when I find glaring errors in the first few pages of a book, I know I will never read further. When I think about it, my standards are higher for pbooks than for ebooks. I think that is a result of two factors: First, that nearly all my pbook purchases are nonfiction, primarily history, biography, philosophy, and English language. Consequently, I expect greater accuracy and better production values because these books are not read-once-throw-away books. Second, that the nonfiction books all command a much higher price than the fiction ebooks, or I am willing to pay more for nonfiction than for fiction and so expect more. I am more forgiving of fiction ebooks than of nonfiction pbooks. However, I would not be so forgiving if I purchased nonfiction ebooks or paid a price for the fiction ebooks that was comparable to the price I pay for the pbooks. Had the error occurred once, I would have chalked it up to a typographical error; but these errors occurred repeatedly. Interestingly, a couple of times the authors actually got it right, only to return to the incorrect word. These errors are significantly more than a mistyping or misspelling — it demonstrates a lack of command of language because seam and seem, for example, are not even close in meaning. Thus a review of the first chapter is important and I have come to the point that I will not buy an ebook whose first chapter, or a significant portion thereof, I cannot sample. And even if the author seems to write well, that is, is a good storyteller, I won’t buy the ebook if the sample is loaded with editorial problems; I know it will annoy me until I just give up trying to read the ebook. This is the advantage that a pbook has over an ebook — not that a pbook cannot have these errors, they can, but that I can return the pbook; most ebooks are not returnable. Pricing is my last consideration as I am not hesitant to spend a lot of money on a book that I want. For example, I recently bought Michael Burlingame’s Abraham Lincoln: A Life, which sells for $125 and Oleg Grabar and Benjamin Z. Kedar’s Where Heaven and Earth Meet: Jerusalem’s Sacred Esplanade, which sells for $75. But I don’t casually spend such sums — I buy too many books to spend that kind of money casually. I more quickly and easily spend higher sums on nonfiction pbooks than on fiction ebooks. A lot comes down to the quality of the work in relationship to the price. Although I am willing to be more forgiving of an ebook, I am, correspondingly, expecting to pay a lower price. That is, the lower the quality the lower the price. Similarly, I will not pay a high price for a low-quality pbook. The difference between an ebook and a pbook is that I will consider buying a lesser-quality lower-priced ebook but will not consider buying a low-quality pbook regardless of price. I believe this is the dichotomy of value that I place on fiction (ebooks) and nonfiction (pbooks). Price is less a constraint for me with pbooks because I rarely get to the matter of price if value is lacking; I am simply less forgiving of pbooks than of ebooks. Pricing is a constraint only in the ebook buying decision-making process. For lots of reasons, but primarily because of lower quality, I am very reluctant to spend more than $3 to $5 on an ebook. Consequently, when an ebook passes muster — that is, I get past the reviews, the cover design (or lack there of), and the sample content — I make my decision based on price. I need to believe that the price has some correlation to the quality. If there is a close correlation, I will buy the ebook; the farther apart price and quality are, the less likely I am to buy. That is how I decide whether or not to buy a book. In part I of this 3-part article, I discussed the role reviews play in my decision-making process as to whether or not to buy a particular book. As noted, reviews are rather limited, largely because there are so few credible reviews and so many books published each year. The next thing that catches my attention is the book cover (cover is used to mean both the printed cover or cover art and the dust jacket). Either a book cover grabs your attention or it turns you away. The cover is what you see before you read the first word of the story. The cover actually conveys a lot of information about a book. Presumably the book title has been carefully chosen to describe (or at least give a clue as to) the content. For example, I recently bought A Savage Conflict: The Decisive Role of Guerrillas in the American Civil War by Daniel E. Sutherland (2009). What first caught my eye was the title. This title tells me what to expect: I expect to read a book about guerilla warfare during the U.S. Civil War. The cover also tells me who the author is; in this case I recognized the name because he has written several other books about the Civil War. Also on the cover is the publisher’s name. This book was published by the University of North Carolina Press. And there is the dust jacket blurb that tells me something about the book. Finally, there is the cover art itself. In this case, it is a drawing of a raid scene. All of the elements of the cover give credibility to the book. They don’t assure me that the book is well written, but they do give me some assurance that the content is content I’m interested in; that the author has experience in and knowledge of the area; that the book has been vetted, at least minimally, by a respected academic publisher; that the content fits the title; and that the content is trustworthy. All of these are important assurances, even if they are not consciously perceived by the book buyer. That’s when I consider the story synopsis. Next to the cover art, the jacket blurb can be, for me, the make or break in the book-buying decision. A well-written blurb summarizes the book. In the case of fiction, as soon as I read “vampire” or “zombie” or “romance” or certain other key words, I know to move on. Those aren’t stories that I care to read. But the right key words drag me further into the book, and so I want to check out the first chapter. Unfortunately, not all book covers are so reassuring, and the covers become increasingly less reassuring as one moves first to fiction and then to self-published books or books published by presses who devote minimal resources to capturing and/or reassuring buyers via the cover design. This is particularly problematic for me when buying an ebook, which is the form in which I buy nearly all my fiction books. Many of the fiction ebook “covers” are no better than the crayon drawings my 2-year-old neighbor draws. And covers do matter; they are what first bring a book to one’s visual attention. They are the inducement to open the book and exploring the content. Some covers are so amateurish — childish might be a better description — that I immediately assume the content can’t be any better. Often I go no further in exploring the book, but when I do, I often find that my assumption was correct. Cover art does play a significant role in the book-buying decision. Even if the cover drawing resembles the content, when it is childishly executed, it casts doubt on the quality of the writing. Poor cover design and art does not give a sense of assurance. The higher the price of the ebook, the greater the risk. On the other hand, because of how ebooks are prepared and sold, I try hard to not base my buying decision solely on the cover art. Sometimes I can’t get past the poor cover design, but most of the time I am able to go beyond the cover and into the content. Authors and publishers need to keep in mind that a book is much more than just its content. Although content ultimately is the most important part of a book, it is also the last part of the book that is encountered by the book buyer. Consequently, as much care as is paid to the content needs to be paid to the other parts that make up the totality of the book. It does the author no good if the book buyer goes no further than the wrapper; the author and publisher need to make the wrapper as compelling as the content. Part III, tomorrow’s article, discusses the final legs of the buying decision process: content and pricing. Subsequent to the posting of this article I came across the following video on the making of a book cover. The 2-minute video compresses the longer process of designing a book’s cover and highlights some of the skill involved. I have been thinking about what goes into my decision whether or not to buy a particular book. An ever-increasing number of books are available every year — enough to overwhelm any dedicated book buyer. I suspect that the only time the decision was (relatively) easy was in the days of scribal versions and the early days of the printing press and moveable type. I recall reading that even at the time of Thomas Paine’s Common Sense, thousands of books and pamphlets were being written and published every year. Books have always been a treasure for me. I remember, in my childhood, going to the library every week to borrow a dozen or so books to hold me until the following week’s trip. And when I began to earn money, I spent more money buying books than on anything else that was leisure related. Although book buying isn’t my most expensive outlay today, I still spend thousands of dollars every year on books. Some of those books are books I plan to read some day when I have time, but which in reality will never have the binding cracked because something else will take reading precedence — and eventually time does run out. So how do I decide which book to buy and which to pass over? The process is really more complex than I had thought, especially considering that (according to The Economist) more than 400,000 books are now published every year in the United States and United Kingdom. Plus, I need to separate ebooks from pbooks because the process is different in several respects, not least of which is that ebook purchases are always fiction whereas pbook purchases are almost always nonfiction. Over the course of the next 3 articles, I plan to examine what goes into my book-buying decisions. Admittedly, this is a personal approach, but I suspect that many book buyers’ approaches mirror at least some of my approach. Let’s begin with reviews. Reviews as a factor do not need to be separated by the book’s format. The bottom line is a review is applicable to either the ebook or the pbook, unless the review is focused on formatting gaffes that are peculiar to one version rather than to both. There are essentially four types of reviews: online starred reviews at the bookseller, independent online reviews, friend reviews, and magazine-type reviews, such as the New York Review of Books (NYRB), The Atlantic, and the New York Times Books Review (NYTBR). Each has its own credibility level. For me, I’ve listed them in ascending order, that is, least credible are the starred reviews, more credible are independent online and friends’ recommendations, and the most credible, for me, are the magazine-type reviews (including newspaper reviews). A number of people have commented that when buying a book they look at the bookseller’s, such as Amazon, rating: What have other readers at this bookseller thought about a particular book? Some readers apparently give great weight to the online reviews, others scant weight. I give the reviews at the booksellers no weight whatsoever; I don’t even look at them. Why? Because I believe that too few of the reviews are honest reviews of the content; instead, the reviewer has some other agenda (such as pricing or religious or political protests) and I have neither the time nor patience to weed through the reviews. If a book has 100 reviews, 95 of which are 1 star, how can you be certain — regardless of the review’s content — of the verity of the content review. Plus I have no idea who sallyfromarkana is or why I should care whether he/she liked or disliked a book: How do I know sallyfromarkana really read the book? Or understood the book? Or isn’t bosom buddies with the author? Or isn’t a bitter ex-spouse? How knowledgeable about the subject matter is sallyfromarkana? Can sallyfromarkana really tell me how this book compares with the previous three books on the same subject, which is important in the case of nonfiction? Then there is the “King” complication. I already know that hundreds of thousands of book buyers love to read Stephen King, James Patterson, Dan Brown, J.D. Robb, and many other authors. These best-selling novelists represent the King complication; that is, if sallyfromarkana reads these authors, how in tune with my tastes is she when I avoid their books? How do I know what other books he/she has read and/or reviewed and the quality of those reviews? Of how much worth is sallyfromarkana’s review of a Doris Kearns Goodwin book to me when sallyfromarkana gives Stephen King 4 stars, Dan Brown 1 star as a price protest, and Doris Kearns Goodwin 3 stars? This problem also surfaces with the independent online reviews. Additionally, those reviews require searching to find and a lot of effort to discover whether the reviewer is good or bad, thorough or not. It requires a lot of time and work, something I am not desirous of expending looking for a review. Friend’s recommendations have greater credibility for me, as I suspect they do for most book buyers. The problem is that our reading tastes rarely coincide; my taste in books doesn’t even coincide with my children’s. None of my friends have read, for example, Michael Burlingame’s Abraham Lincoln: A Life or Doris Kearns Goodwin’s Team of Rivals: The Political Genius of Abraham Lincoln. But they have read the new Dan Brown or Clive Cussler novel. That really leaves me, as far as reviews go, in the hands of the professional reviewers, such as the NYRB and NYTBR. The reviews in the NYRB are my particular favorites. They are in-depth, tell me whether the author knows the subject matter well, and refer me to other books on the same subject or from which the reviewed author obtained information. I’ve bought several books that have been mentioned in a NYRB review that are not the subject of the review. Alas, outlets like NYRB and NYTBR are limited, especially for nonfiction. There are only so many reviews that each can contain in an issue. So although these types of magazine reviews do influence my decision making, they do so on a limited basis, simply because of the limited number of books reviewed compared with the ever-expanding number of books published. But also worthy of mention, at least in the case of the NYRB, are the book ads placed by university presses. With all the books being published each year, one of the things I rely on to learn about a new university press book are publisher ads. They aren’t reviews but they at least alert me to something that may be of interest to me and that I should check out. Part II, tomorrow’s article, discusses the role and importance of a well-designed cover. Part III, the final article in this series, discusses the final two legs of the decision-making process: content and pricing. In The Business of Editing: The AAE Copyediting Roadmap VIII, I began discussing the macros I use during editing. 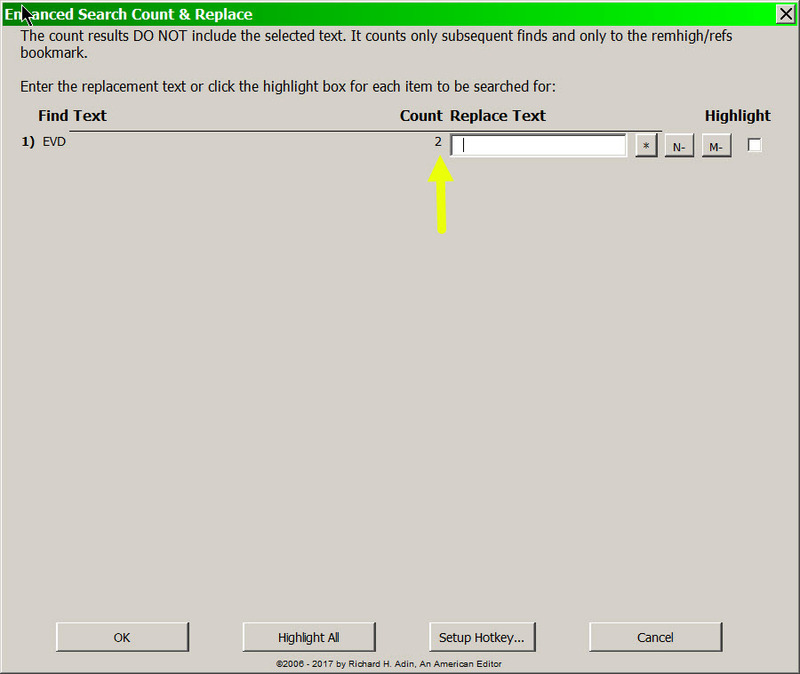 My discussion continues with the Enhanced Search, Count, and Replace (SCR) macro. Once I have selected the search term, I run SCR. The macro automatically will “create” search variations (see image below). 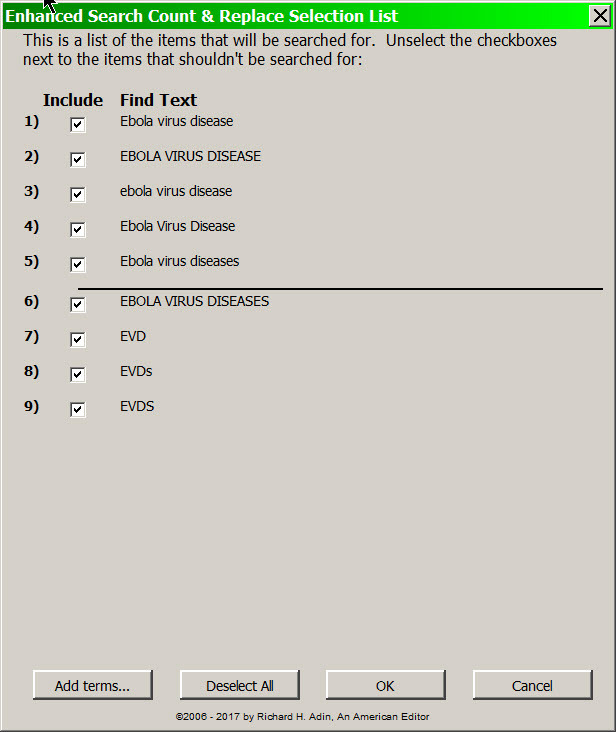 I can choose to let the macro search for all (leave all of the “Include” checkboxes checked) or some (uncheck those I don’t want included in the search) of those variations and by clicking the “Add terms” button, I can add variations I want included in the search (e.g., I could add “eVD” or “ebola Virus disease”). Usually I just leave all of the items checked and do not add additional terms; occasionally I make additions and changes. Tip: Be sure to check what the macro is going to search for and think about it. Macros are dumb and do exactly as instructed. Consequently, if your search phrase is “T-helper (Th)” the macro will find every word that begins “Th” or “th” or “TH”. 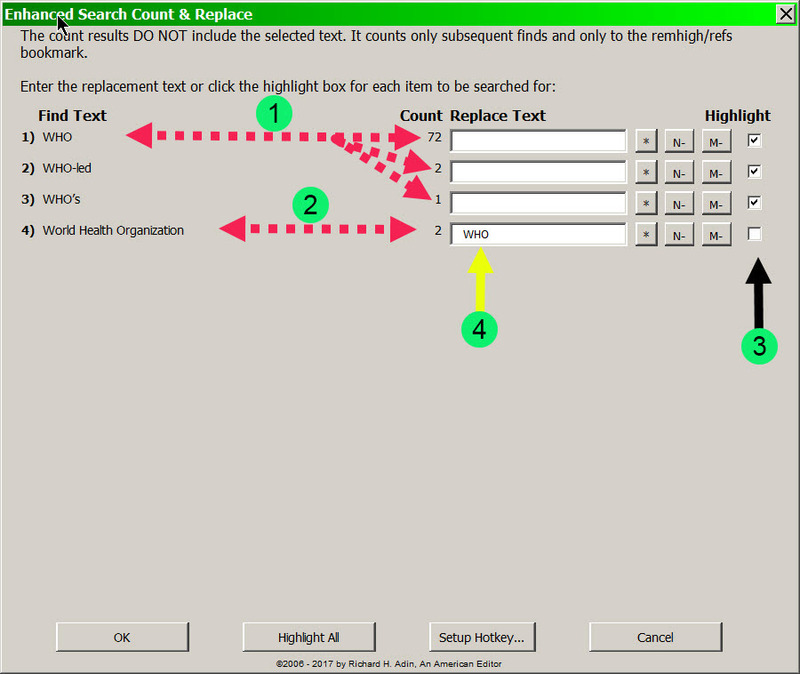 The search has the same limitations as the standard Word search. Sometimes there is no avoiding getting a return with excess information, but other times a tweak in the search term (e.g., unchecking “Th” and adding “Th-1” and “Th1”) can accomplish what you want. Clicking OK will cause the macro to replace those instances of “EVD” with “Ebola virus disease” as shown below. Note in the image that the change is automatically made with tracking on. There are 75 instances of WHO (#1 in above image) and two instances of World Health Organization (#2) in the chapter. Applying the client’s rule, the 75 instances of WHO need to be highlighted (#3) and the two instances of World Health Organization need to be changed to WHO (#4). Tip: The count that is returned by the SCR macro does not include the original selected text. In this example, the selection was “World Health Organization (WHO)” (see earlier image), so that instance was not included. What that means is that the true count is 76 instances of “WHO” and three instances of “World Health Organization” appear in the text. Had I selected only “World Health Organization” as the search text, “WHO” would not have been counted unless I manually added it as an additional search term, meaning that the search result would have been three instances of “World Health Organization”. When searching, the macro (most of the time, but not always) ignores parentheses and square brackets. To make it easier to add additional variations or to enter replacement text, when I select the text to be searched for, I also copy it to the clipboard. That way I can paste the phrase into the appropriate blank field rather than type it and just make adjustments to the original search text to create additional search variations. Most of the time that works easily; sometimes it is easier to type what I want added. To highlight the instances of WHO, I check the Highlight box (#3) for those that I want highlighted. The purpose of highlighting the text is so that as I edit the chapter, I can see that I have already made sure that the acronym/initialism has been spelled out and/or that the phrase has been checked (perhaps, e.g., I confirmed that the spelling or name is correct, such as “bevacizumab” or “chikungunya” or “Chinese National Biotec Group”). 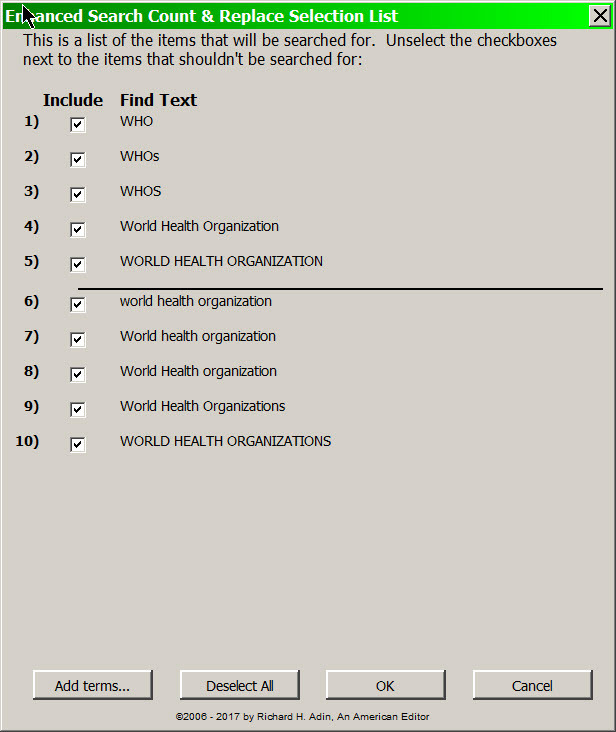 To change “World Health Organization” to “WHO”, I type “WHO” in the Replace Text field (#4). 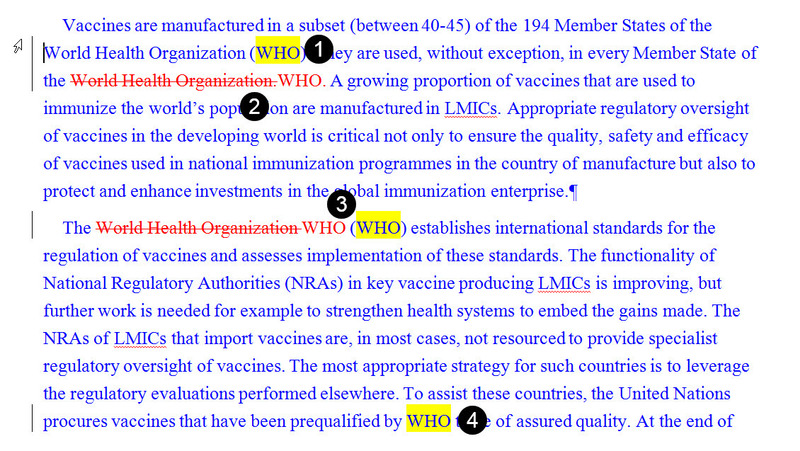 Instances of “WHO” have been highlighted (#1, #3, and #4) and the two instances of “World Health Organization” (#2 and #3) have been deleted and replaced by “WHO.” Note, however, that the first instance of “World Health Organization” (#1), which is the instance that I had selected for the search term (see earlier image) remains. Note also that the deletions of “World Health Organization” and the additions of “WHO” are shown as tracked changes. If tracking is off, SCR turns tracking on, makes the changes, and turns tracking off; if tracking is on before it runs, it leaves tracking on when it is finished. SCR performs another very valuable function in my editing: It helps me determine whether the acronym/initialism or the spelled-out version predominates. It is not unusual to get a report indicating the acronym/initialism appears, for example, five times and the spelled-out version appears six times. When that happens, as the editor I need to decide which form to use and which to replace. Of course, also entering the decision-making process is how I will justify my decision and whether I have an explicit instruction from the client that tilts the balance scales toward a particular response. When I get the report, I can determine whether any of the 12 phrases (the original selection plus the 11 added terms) appear later in the text and if they do, how often. That allows me to decide which form to use and which ones I need to change so that usage is consistent — and to make any necessary changes immediately. SCR is another tool in my consistency arsenal. Once I make the decision, assuming this is my first encounter with the phrase, I note my decision on the stylesheet and add the change to the Never Spell Word project-specific dataset (see The Business of Editing: The AAE Copyediting Roadmap V) so that the change is implemented in all subsequent chapters. SCR is a more sophisticated form of Word’s Find & Replace function. 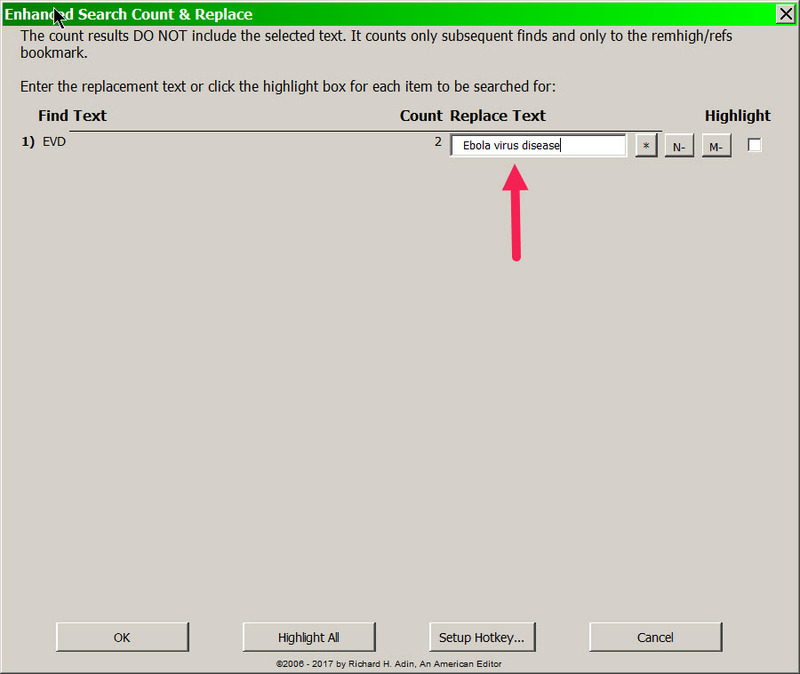 Using Word’s Find & Replace requires multiple searches to be sure that most of the likely variations have been searched for. In addition, using Word’s Find & Replace doesn’t provide an easy way to mark text so that you know you have already checked it and it is okay. Although the examples I use are nonfiction, SCR is a great tool for fiction editors. For example, you can search for character names and spelling variations (Mariah, Marya, and Maria are three spellings of the same name — although if the results came back Mariah = 100 and Maria = 63, I would query the author [and myself] whether these are the same character or different characters, and if the same character, which is the correct spelling). It’s the rare manuscript that can go through editing and not have comments or queries inserted; in all of the hundreds of manuscripts I have edited, there have only been two or three. The Business of Editing: The AAE Copyediting Roadmap X discusses how I use, insert, and edit comments/queries during editing. I have been spending my weekends visiting my hospitalized, dying, 80-year-old aunt. There would be little worse than not to be present to say goodbye. I realize all of us ultimately meet this same fate, but not necessarily in the same way. In my aunt’s case, she has stage IV ovarian cancer that has spread widely. The cancer is complicated by other lifelong ailments. The scenario is not good, the end already written; it is not if, but when. But in visiting with her I learned just how unprepared she and my 88-year-old uncle are to deal with these times, which made me wonder how prepared my colleagues are. I know that as unprepared as my aunt and uncle are, my wife, Carolyn, and I are prepared. By prepared, I do not mean ready to face the ultimate call. Rather, I mean prepared in case of a medical emergency. I am referring to living wills, healthcare proxies, and membership in an organization like MedicAlert. The documents (living will and healthcare proxy) may be called something else where you live, but the function — and importance — remain similar. A healthcare proxy is your designation as to who is to make medical decisions on your behalf should you not be able to make those decisions yourself. The usual order is a spouse/significant other, followed by an adult relative, but it doesn’t have to be. The people you name can be anyone you trust to carry out your wishes. The only caveat is that in most places the responsibility is singular, it cannot be joint. What I mean is, you can name your spouse and if your spouse can’t or won’t serve at the time, then your adult child can become your proxy; what you cannot do is give your spouse and adult child joint responsibility, requiring them to agree on the care to be given. The reason is that there may be disagreement and thus no decision. The key is knowing what care you want or are willing to accept (e.g., feeding intubation vs. no feeding intubation) and communicating that information to the people you designate as your proxies. In my case, I have sat with my proxies and my doctors and repeatedly stated what care and treatment I want and do not want — I have “hammered it home” so that there is no misunderstanding. I do understand that expressing my wishes does not ensure that my proxies will follow my wishes. But when it comes time to make decisions, they will be able to weigh my desires as part of the decision-making process — more importantly, I will have relieved them of the burden of trying to guess what I desire and wondering if they have made a wrong decision. My aunt and uncle have declined over the years to create and execute these documents. Their reasons have been many, but the biggest factor was a fear of losing control. There is no loss of control; the proxy becomes the decision maker only when you are incapable of making a decision. In the absence of the healthcare proxy, it is the doctors and care facility management that will make the decisions. They may ask for family input, but they will do as they please. This I know from personal experience. Along with a healthcare proxy, which names your proxy decision makers (i.e., the named proxies become you for this purpose) in your preferred order, the prepared person also has a living will. The living will is an instrument that outlines the care you want or don’t want, as well as my end-of-life care choices. In my case, for example, my living will spells out the boundaries of my Do Not Resuscitate (DNR) request and indicates which intubation procedures I approve and which I decline. The living will is your taking possession of your medical treatment. Do you want anything and everything done for you that might, no matter how unlikely or how great the pain and expense, extend your life, even for only a few weeks, or are there limits you want enforced to such treatment? Having a living will — and making a point to review it every couple of years — forces you to evaluate your current medical condition and your current views on treatment. Neither the Healthcare Proxy nor the Living Will are written-in-stone documents. You can revoke or change them at any time. Most states offer fill-in-the-blank forms online, along with instructions for these forms, but the best method is to visit with a lawyer. The third part of being prepared is membership in an organization like MedicAlert. I know that medical alert bracelets and necklaces can be bought in any drugstore, but they are inadequate. I have been a member of MedicAlert for decades. I consider it one of the best investments in personal safety that I have made. In addition to being able to choose the kind of identification I want to wear (I now wear the silicone bracelet and carry the medical ID keychain; Carolyn wears a different bracelet but also carries the keychain) and the information I want engraved on the ID, MedicAlert lets me keep my medical information online. More important, however, is that I have a unique member identification number, which is required to be engraved on the ID along with the organization’s telephone number. In my case, my engraving reads, in addition to my member number and MedicAlert’s telephone number, “New York DNR Order on file. Call for medical & drug information.” This tells emergency responders that with a telephone call they can get my medical history, a list of the medications I am taking along with dosage and frequency, the names of my physicians and contacts (e.g., next of kin) along with contact information, and any other documents I have stored with MedicAlert (in my case, copies of my Living Will, Healthcare Proxy, Medical Orders for Life-Sustaining Treatment [the New York MOLST form], and Do Not Resuscitate order). I do not need to be conscious or able to recall my medical history or know what drugs I am taking. I do not need to carry documents with me wherever I go. MedicAlert is accessible by emergency responders, doctors, and hospitals every minute of every day. Responsibility for maintaining and updating my medical records lies with me, which means that I do not need to worry whether someone else has submitted information on my behalf. It is done online or via telephone. I have made it a practice to give every doctor I see and every urgent care or hospital I visit for tests or routine care my MedicAlert member number and MedicAlert’s telephone number. I started with my aunt and uncle and now we come full circle. They are of the generation that does not believe in sharing personal information (they do have neither a computer nor a smartphone), so they have been reluctant to make use of the various forms or to join MedicAlert. The consequence is that now, when these would be of most value, they are scrambling. They wonder, for example, whether there is something they have forgotten to tell the doctors; unfortunately, in the absence of the healthcare proxy form and because of the U.S. HIPAA (Health Insurance Portability and Accountability Act), their children cannot check the information given to the doctors and the hospital, and even if they could, may not know if the information is complete. How much simpler it would have been had the doctors and hospital been able to call an organization like MedicAlert and have all necessary information immediately sent to them. My family will not have these problems; they will have access to my information and will know, when required to make a decision about my medical care, what my desires are — I will have already made the difficult and important decisions. Will your family be similarly situated? I know that many of my colleagues swear by Fowler’s Modern English Usage, 3rd edition. Although I own it and occasionally use it, the number 1 usage book for American English is Garner’s Modern American Usage, Third Edition. But, as of this past June 1, Garner’s has some new competition — the updated fourth edition of Fowler: Fowler’s Dictionary of Modern English Usage edited by Jeremy Butterfield, or Fowler’s 4th. I received my copy yesterday, so I am not yet ready to give an opinion, but I plan to use it each time I use my Garner’s 3rd. One of the things I like about Garner’s, which is lacking in Fowler’s 4th, is the “Language-Change Index,” which gives me a clue as to how usage is trending. Both books are published by Oxford, so I suspect a new edition of Garner’s may be in process. For those of you who are like me and “collect” usage guides, it is interesting not only to compare entries in current versions of the guides, but also to look at past editions and see how usage has evolved. In any event, it is important for professional editors to remember that these are guides. Their opinion should weigh in your decision-making process, but should not dictate your decision. See, for example, “Editors & “Professional” Resources: A Questionable Reliance” and “The Makings of an Unprofessional Editor” for additional discussion. If a job is going sour, do you (a) cut corners, (b) tell the client and try to renegotiate time and/or money, (c) just grind through it even though you’re making no money and the rent/mortgage/bills are due, (d) something else? I suspect that all of us have faced this problem in our editing career. I also suspect that each of us has a different approach to the problem. But let us start at the start of the problem: with ourselves. When we took on this souring job, did we ask to see the manuscript or a sample before agreeing to do the editing? If we did, then why didn’t we see the problems that are now causing the job to sour? If we didn’t, why didn’t we? In discussions, many editors state that they always ask to see a sample and that they instruct the client as to what they want to see. Other editors, like myself, never ask to see a sample unless it is a one-off project for a one-off client, which would be the usual case when dealing directly with the author. In the one-off instance, I ask to see the whole manuscript and I skim it. But when I am doing work for a packager or a publisher, I never ask to see a sample (sometimes they send me sample chapters). Now that I have stated my blanket rule, let me state the “exception.” If the schedule is short in comparison to the client’s estimate of the manuscript size, and if the client also states that a medium or heavy edit is required, I do ask to see the entire manuscript. I want to do my own page count so I can determine whether the schedule is doable. Aside from doing my own page count to evaluate the schedule, I pretty much rely on my rule of three, which we discussed in The Business of Editing: The Rule of Three. But I’m drifting from the posed questions, so let’s drift back. Once I agree to undertake a project, I feel bound to perform the agreed upon job for the agreed upon fee and in the agreed upon time (assuming that is at all possible). So, given the choices Teresa outlined, I would adhere to choice c.
If I am not making money on a project, that is my fault, not the client’s fault. If I didn’t ask to see sample chapters, that is my fault. If I didn’t do my own page count, that is my fault. If I failed to determine how difficult the editing would be, that is my fault. Basically, the client has no fault in this transaction, so why should the client suffer any penalty? If the client told me that the manuscript ran 500 pages and the client didn’t have all of the manuscript available for me to do a page count at the time I had to make a decision, and I have hit page 425 and know that I still have 10 chapters to go, and when I finally receive the remaining chapters I discover that instead of there being 75 pages to go, there are 500 pages to go, then the fault lies with the client (assuming I asked for the complete manuscript; if I didn’t ask, then none of this matters — it remains my fault) and I would advise the client that the schedule is not doable and needs to be renegotiated. What I would not do — ever — is cut corners or try to renegotiate the fee, unless the fee was a project fee based on the original representation of size. If the fee is per-page fee or an hourly fee, I would simply apply that same rate to the additional pages and time. If the fee arrangement was a project fee based on the manuscript being a certain size, and if the final size significantly differs, and if the client will not renegotiate the fee, then I think it is correct to return the balance of the project to the client, once I have edited the amount I agreed to edit. Ultimately, the issue boils down to how much preparation we editors do when determining whether or not to take on a project. The more preparation we do, the less likely a project will go sour. Having said that, I realize that in evaluating a project I may not have looked at the most problematic chapters, the chapters that cause a project to sour. But if those chapters were available to me for the asking, then it is my fault and I live with my poor decision making; if the chapters were not available, then it is the client who is at fault and who needs to bear the consequences. As the experienced editor, I should know whether I can do a medium edit of a manuscript written by nonnative English speakers and that is 500 pages within 10 editing days. If I say I can, then I need to do it; if I don’t believe I can, then I need to negotiate with the client before accepting the project. If I accept the project knowing that it will be very difficult for me to meet the schedule, then it is my fault and I need to figure out how to accomplish the task. Which raises another side, but important, issue: editing days. When a client sends a project with a two-week schedule, the client counts every day in that two-week period as an editing day. In addition, the client thinks in terms of full days. I, on the other hand, do not count weekends and holidays as editing days and I recognize that quality begins to decline rapidly after about 5 hours of editing. That is, I calculate the maximum editing day length as 5 hours of editing. The 500-manuscript page project is viewed by the client as requiring editing of 36 pages a day (2 weeks = 14 editing days) at a rate of 4.5 pages an hour. I view that same project as requiring 56 pages per day (2 weeks = 9 editing days) at a rate of a little more than 11 pages an hour. Consequently, the issue becomes do I think I can do a quality medium edit at the rate of 11+ pages per hour? If yes, the project can be accepted; if no, then schedule needs to be negotiated. If the client insists on the two-week schedule, then the fee has to rise because I will need to work weekends to meet it. But once I have accepted the job, as long as any fault in the decision-making process was mine, I do not return to the client because the job is turning sour. I “just grind through it even though [I’m] making no money and the rent/mortgage/bills are due.” If any fault lies with the client, then I try to renegotiate the schedule, but not the fee (unless it was a project fee and the size of the manuscript has changed significantly). Unfortunately, that leaves me in the same position of grinding through. I remain a firm believer that a deal is a deal and maintaining that deal is the ethical way to do business. What do you think?